STO.DOMINGO, ALBAY (Jan.13) – A snappy salute was rendered to the late Marine Hero PFC ALEJANDRO A. BALEAN PN(M) for his heroism and sacrifice upon the arrival of his remains here, his hometown Friday morning. The Officers, Sailors, and Marines of the Naval Forces Southern Luzon (NAVFORSOL) led the Military Honors to the remains of Pvt. 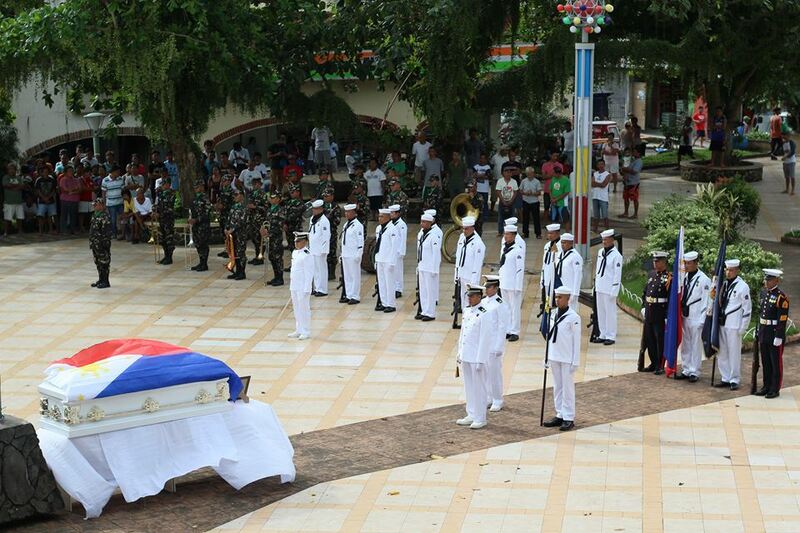 Balean attended by his family, local officials headed by Mayor Herbie B. Aguas, and the Domingueños. Aguas expressed his mixed emotions in an interview with DZGB News for the loss and the recovery of the remains of the late hero. He said that the sacrifice and heroism of Pvt. Balean will be instilled in the hearts of every Domingueños to stand for what is right and fight for the Filipinos’ struggle for freedom. The family of the late Pvt. Balean was awarded by the Local Government of Sto. Domingo with a plaque and financial assistance. Pvt. Balean was one of the fallen heroes who fought against the Maute terrorists for the liberation of Marawi City and was reported missing in action last June 9, 2017 in the vicinity of Mapandi Bridge, Brgy. Dagubduban, Marawi City while their platoon was manuevering against the enemy. In August last year a cadaver was recovered clad in camouflage pants believed to be Balean ,and was subject to forensic examinations. In November 2017 DNA samples was taken from his brother and sister to matched with the DNA samples taken from the recovered cadaver. December 2017 when the result was released and confirmed that it was Pvt. Balean.